We've been busy working on paperwork and waiting on our home study to be completed by our social worker, then approved by our placing agency, and signed off on by the director of our home study agency. That all happened just before Christmas so we were able to put our home study and I-800A application in the mail on the morning of Christmas Eve! Today we got our receipt via email from immigration. We should get the actual receipt in the mail next week and then hopefully an appointment date for fingerprinting soon after that. Once we get finger-printed (likely towards the end of January or early February...depending on when our date is), we'll wait for the approval for those. Once we have that approval, we can send all of our documents to our state capitol to be authenticated and then to the Chinese Embassy in Chicago for certification. Once that process is done, we will send off our entire dossier (all the adoption paperwork) to our placing agency. They check it over and send it off to China. At that point you are considered to be DTC (Dossier To China). There are many more steps after that, but getting to that step will be a huge relief! People often ask when our little girl will be home or when we'll travel. It's still too early to tell, but our best guess is July or August at this point. There are a couple steps that make it a bit hard to predict from this point, but that's our guess. We've also been busy doing some Hague training online. We had done 12 hours of it for Lena's adoption and were lucky to not have to do it for Reid's adoption because our adoptions were back-to-back. We learned this time that even though we met our state requirements, the Hague training is only good for two years so we had to do another 12 hour program because we were a little over two years. She doesn't look very happy, but she sure is beautiful and it looks like her foster family is spoiling her! Look at her in that white fluffy coat and cute purple scarf with that long hair! 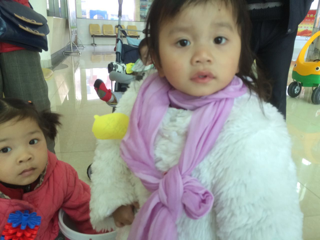 We hope she got our care package we sent with her former foster brother's family. Celebrating the holidays is always bittersweet. We can't wait to have her home next year for this special time! We're working hard to get to you sweet one! More Birthdays and Merry Christmas...Playing Catch-up! Every time I think I need to update our blog, I find a million other things on my to-do list and it just keeps getting pushed down to the bottom of the list. Then I find myself up way way too late, unable to sleep for multiple reasons, and I think to myself...now is the time to update the blog. December has been a busy month to say the least. It will always be that way in this house. We have three birthdays in December in one week and that is just in this house. Our extended family pretty much cover at least half of the December calendar. Jayce had his birthday the day after Lena's. We actually had a bowling party that morning for Lena because her birthday was on a weekday and Jayce didn't want to have a party. I did tell him he could have a friend come to bowl with him though since it was his special day. He wanted to go to Chuck E Cheese as a family and play some games. To be honest, that's the way to go. We all had fun and it didn't cost us near as much as any birthday party we've ever had. I like it! Jayce being celebrated at school. On the night of Lena's actual birthday, we had Pizza with Santa at dad's school. Our elf visited Jayce's stocking for his birthday too! Bowling party! It was so awesome to see Lena in her element with her friends who are deaf like her. I can't wait to see her with her new sister! Jayce and his buddy he invited. They had a blast! Lena with a friend and school classmate. 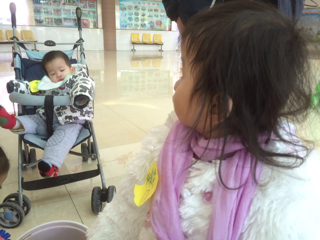 His sister came too. She was in pre-school with Lena when Lena first started at the school for the deaf since kids start at age three and stay until they move on to kindergarten. This was just too cute for words...they kept doing a ring around the rosie like thing. I did have to try to move them off the alley though so others could bowl..lol! Jayce's cake- he wanted a lot of sprinkles. We had a lot of Christmas concerts to attend too. Jayce's was on my birthday...my little angel. Lena had two Christmas concerts two days later. 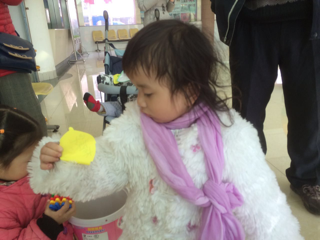 The first was for her hearing 4K class that she goes to in the afternoon, where she has an interpreter. 4K concerts are like controlled chaos. The kids all tried to sign some- that was cute. Her second concert was at the school for the deaf. The pre-schoolers did a cute little skit- short and sweet. We try to get a picture of all the kids together around the holidays each year. Every year it gets harder to get a good one. Someone is always doing something with their hands, making a funky face, not looking, or crying. :) Rowan has had a lot of pictures like this, this month. Opening gifts for the cousin gift exchange and gifts from grandma and grandpa! Christmas morning at our house- checking out their stockings! Evan is the lucky one who got one of nana's awesome homemade stockings...then we just grew too quickly and no one else in this house has one yet. I treasured mine when I was a kid! Rowan was getting into somebody else's candy that they left on the floor. After we opened gifts, we headed up to Wisconsin Dells where my mom, step-dad, brother, and his girlfriend were waiting for us. My aunt, uncle, and cousins from Texas were up and had a time share there. We spent two nights up there and the kids had a blast at the water park! Thank you Aunt Denise and Uncle Jeff!! This is my crazy younger brother in a borrowed swimsuit because he didn't bring one of his own. He was doing an impression from a Youtube video he showed us. It was ridiculous, but pretty funny! Here's the video, "Stop Buying Stuff: Love is the Answer!!" Evan had his first sleepover at a friend's house! He was so excited and the kids had a great time! Those sleeping bags from grammy and grandpa are sure coming in handy! This picture just says TROUBLE! Between all gift openings, Landyn ended up with THREE nerf guns. I'm starting to wonder if I should have even put that on his wish list...lol. I'm picking up the soft bullets everywhere! Grandpa Linse came up from Florida for a surprise visit for a couple days. We hadn't seen him since about this time last year. The kids enjoyed spending time with him! Evan wanted hockey gear for Christmas this year. Rick decided to make a little ice rink on our patio in the backyard. It should be totally frozen and ready to go in the morning. We plan to put some padding around those pillars and we realized we had a 3-4" slope on the patio. The kids are excited! I am wondering how many trips to the ER/doctor we'll have! Just praying for no broken bones or teeth. :) I'm sure a lot of memories will be made! Today our beautiful little girl turned 5 years old. It is hard to believe she is 5! Five just seems so much bigger for some reason. 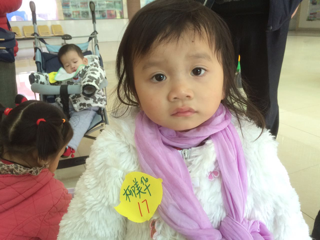 In just one more month, we will have had Lena home for as long as she lived in China. Time flies! Lena has blossomed so much these past two plus years. It's been incredible to witness. She just beams with excitement for life and for people. She is such a happy little girl who almost always has a smile on her face. She is so bright and doing so well in school and she loves coming home and working on projects or educational activities. She is a total girly girl who loves to accessorize, but you can sometimes tell she has a lot of brothers too. She isn't afraid to get dirty and she likes to find and pick-up bugs outside too. Lena wasn't the quickest to open up and bond to us- that happened slowly and over time. She's been learning ASL right along with us and having a language has helped tremendously with her ability to bond and attach. She gave her dad a hard time for a REALLY long time. It is beautiful to see their relationship now. She adores him and he adores her. She not only is letting him snuggle and give her hugs and kisses, but she is returning them and even better, she is initiating them! We are just so amazed and proud of her, especially when we think of where she was when she came to us. 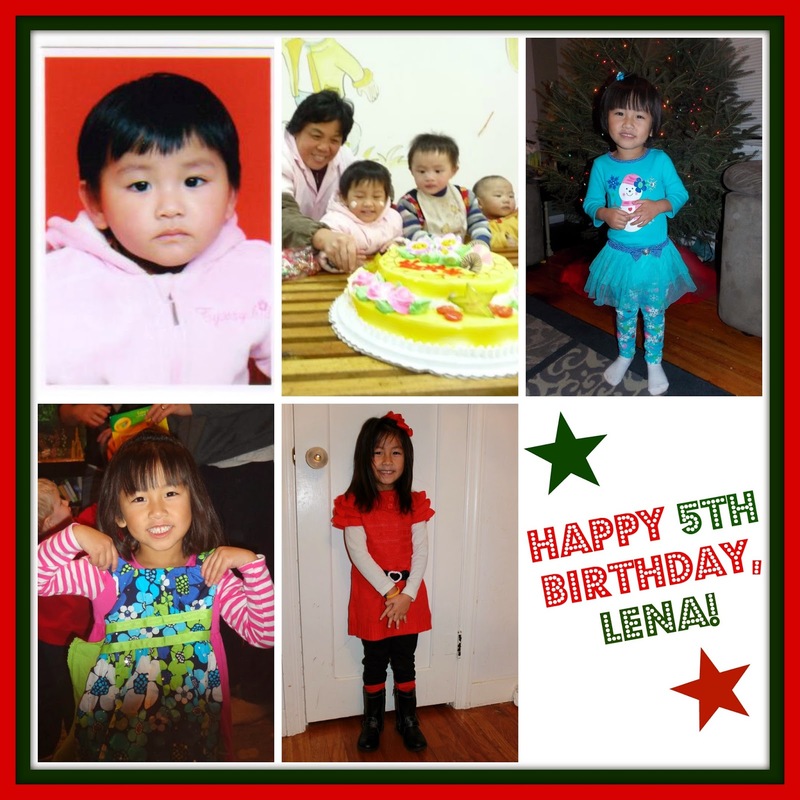 Happy 5th Birthday to YOU, Lena. You've always been beautiful on the outside, but you are just as beautiful on the inside. We love you SO much and can't imagine our lives without you, our little ray of sunshine! Lena with her favorite person in the world! She sure LOVES her baby brother and he must love her too because he lets her hold him and carry him and he doesn't let his other brothers do that...lol. We found our elf, Jolly'Mon in Lena's stocking this morning with a #5 candle! Coming home from school with her birthday crown...a true princess!